We spent the day today at the Kremlin and Red Square. The last time Erinna and I were in Moscow, she was two and our host, Tatiana, kindly offered to watch her while our translator and guide, Julia, took me sightseeing. So for me, today was about remembering that first trip. For Erinna, it was about learning firsthand about her Soviet heritage. Red Square is amazing. 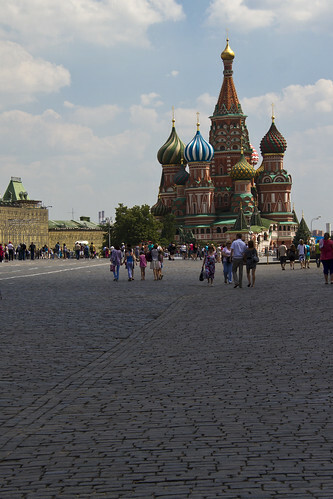 It's huge, and at the far end are the colorful onion domes of St. Basil's. It turned out St. Basil's was closed for some special event, so we headed over to the Kremlin instead. Again, awesome! 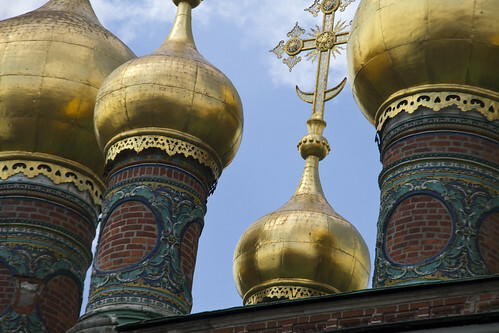 The cathedrals with their gold-plated onion domes are incredibly beautiful, and we walked around the inside of most them as well. The kids were really interested—not! Abby was the most interested, since she's at least from Moscow. But really—they all just wanted lunch, with the promise of shopping at GUM afterwards. In 1993, GUM was more like a giant flea market than a shopping center. The stores carried cheap scarves and those stacking dolls, along with sundries like toothpaste. 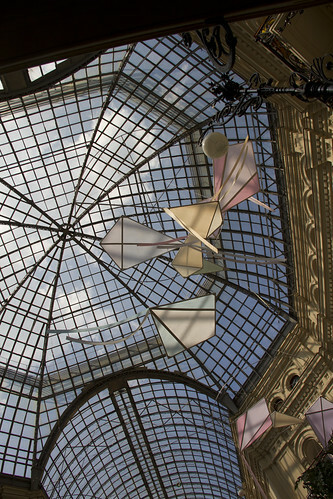 Now, GUM is a high-end shopping center, with Cartier and Dior. We stayed long enough to buy Erinna a $3 pair of socks for $10. She's wearing her "comfortable" sandals today, which, it turns out, are giving her blisters. With her socks, she's not stylish, but at least she can continue walking.